Spa London. Your £24 Gym and Tonic? Author and journalist Sue Ostler reviewed London spas in The Holiday Goddess Handbag Guide to Paris, London, New York and Rome. So how does the (unbelievably affordable) Spa London shape up? Far from making one feel like an Olympian, keeping up with the pace of London can leave one feeling jaded and in need of a little pick-me-up. Fortunately I found just the Gym & Tonic. The Spa London is a twist on the traditional Turkish Bath, with a modern day flourish. A three-hour session was all it took to clear my head, defug my brain and leave my skin feeling like a baby’s. It also left me feeling light-footed and fabulous the next day. Something about the water in this secret hideaway worked its magic on me – no doubt thanks in part to the Gym and Tonic back treatment. Designed for the post workout body, the treatment is a dream if like me, you carry tension in your upper back. First the back is exfoliated with Thalgo Body Scrub, then calmed with a deep tension-releasing, aromatherapy massage and Marine Algae. The warm algae mask soothes aches and pains, while the legs and feet are treated to a relaxing massage with Hydrating Emulsion, leaving the mind clear, body relaxed and skin soft, smooth and revitalised. Ahhh…This is what I call a hangover cure folks! 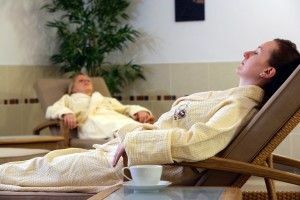 After the hour-long treatment, I was advised to take fifteen minutes to chillax in the relaxation room, before wreaking havoc upon the Steam Rooms of which there are plenty: big and small, wet and dry with varying temperatures, sensations and effects. Once steamed up, I headed fearlessly into the Torture Chamber, bypassing the freezing cold plunge pool and the traditional bucket shower, opting instead, like the chicken I am, for the hot and cold power-shower. Located just a short walk from Bethnal Green Tube Station, the facilities here are maintained with religious fervour. Both immaculate and spotless the Spa really is London’s best kept secret. It is also efficient and affordable enough that you can visit regularly and make a difference to your overall health; especially if you’re planning a big boozy summer –you need to pretox now! Three-hour Thermal Spa Experience prices are £24.00 for non members. At the York Hall Leisure Centre, Old Ford Road, Bethnal Green, London E29PJ.